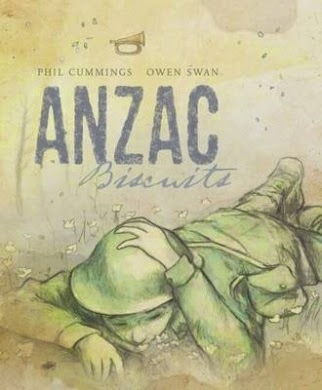 This lovely picture book gently connects young readers with World War I by focusing on a gift sent from home – Anzac biscuits made by a wife and daughter sent to a soldier fighting a war far away. The story of the young girl, Rachel, and her mother preparing and baking Anzac biscuits alternates with the experiences of the soldier on the battlefield. Words from the warm, happy home scene are echoed in the text for the soldier, where illustrations in grey with only a hint of colour convey a much more sombre mood. Anzac Biscuits offers young children a chance to learn a little of the meaning behind the Anzac story while still offering a gentle narrative that isn’t too scary or confronting. I really like the way author Phil Cummings uses the repeated words to connect the two different scenes and provide continuity and Owen Swan’s lovely illustrations match the tone of the story beautifully. This is a lovely story to read any time of the year to help children understand the historical context of the ever popular Anzac biscuit snack as well as offering an opportunity to start conversations about the more serious issue of Australia’s military history. I love this book. One of the very best released for the Centenary.